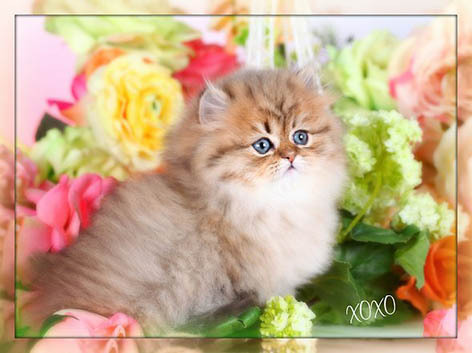 Pre-Loved Persian Kittens For Sale Doll Face Persian Kittens Luxury PersiansPre-Loved Persian Kittens For Sale – (660) 292-2222 – (660)- 292-1126 – Shipping Available!! 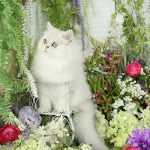 Luxury Persian Kittens for Sale – The world’s most beautiful and highly desired cats! View our Simplified Site HERE! Home of the Fancy Feast Cat!!!! Click here to see Available Kittens! The Face of Fancy Feast!!!! Take comfort in our 30 years of dedicated experience to perfecting these precious furbabies to the absolute finest felines humanly possible! Our family has poured our hearts and souls into this cattery from early mornings, late nights to sleepless nights. We kids grew up surrounded by a wonderfluff of pur~bodies. We learned responsibility, respect and the circle of life at an early age. The older we got, the more knowledge we absorbed. All us kids knew how to deliver a breech baby by 8 years old! LOL! Growing up with them and watching the tremendous amount of effort that went into a cattery that stays open for longer than a few years made us appreciate true devotion. My sisters and I watched how many lives this cattery touched, not the famous cats or the ones that brought the spotlight to our cattery but the ones who touched the heroes of our country. The ones who helped heal damaged hearts after a dreadful divorce or the loss of a child. These cats became bandages for hurting hearts, they became joyful gifts for 30 years of marriage, for a wife who had always dreamed of having a Persian kitten. With so many people who would literally play around with breeding for a couple of years then disappear, we would look at how we bleached out food and water dishes daily. We bathe all our kittens weekly starting at 4 weeks old, the adults get bathed monthly. Floors so clean you could eat off them! All the cats and kittens always stay up to date on their vaccinations and dewormers, all receive topical flea preventative monthly, all tested negative for Feline Leukemia (FeLV) and Feline Immunodeficiency Virus (FIV), all breeders have been DNA tested for PKD. The mommy kitties dine on Royal Canin Queen (a food specially developed for pregnant and nursing cats.) And the list goes on and on. Therefore it’s easy to see how my sisters and I became braided into the furry fabric to continue the faithful journey of keeping Doll Faced Persian Kittens thriving so people would have a highly respected and trustworthy cattery that they knew had been in business the test of time and would continue to flourish because we power on love, not curiosity, greed or adventure. Sale Pending – We are speaking to someone about the purchase of that kitten but no money has been placed. Non-refundable deposits are $200 and hold your kitten for a period of 48 hours. Full balance is due by the end of the 48 hour time period. Prices are subject to change without notice, the only way to lock in the current price is by placing a deposit. Sorry, we do not hold kittens without a deposit. The cattery that proves angels ARE among us! Let OUR pride and passion for perfecting this breed be YOUR peace of mind! To the left, you will find our color categories highlighted in green colored tabs. Click any tab to view kittens of that color category. To the right, we feature a selection of currently available kittens. Simply click any kitten’s thumbnail photo to find out more. Each kitten has his or her own page where we showcase a variety of up to date professional photos and give you a description of that kitten’s unique and loving personality. We have also provided our potential customers with the date of birth, gender, estimated adult size, and the price of each kitten. Some things you see with your eyes, others you see with your heart. Step 1 – Visit our available kitten’s pages and narrow it down to the kitten you are most interested in adding to your family. Step 2 – Fill out the online kitten application, noting which kitten or kittens you are wanting. This online form allows you to tell us about the type of home you have to offer. Step 3 – Place a security deposit on the kitten of your choice. This is done by the payment button in the lower left-hand corner of our website. Simply enter the kitten’s nursery name and click “pay now.” Please note this amount is non-refundable and will be taken off the full purchase price. Step 4 – Once we receive your application and security deposit we will be in touch shortly. We will most likely give you a call to answer any questions you may have about the kitten or process of getting him or her into your arms! For those customers that desire variety, we have a vast color selection available in both the traditional long hair and exotic short hair variety. We also breed several hybrids including the “Eternal Kitten“, our famous Rug Huggers. Only those VIP customers on our paid deposit & VIP waiting list are able to view these kittens ranging from 4 weeks to 6 weeks of age. 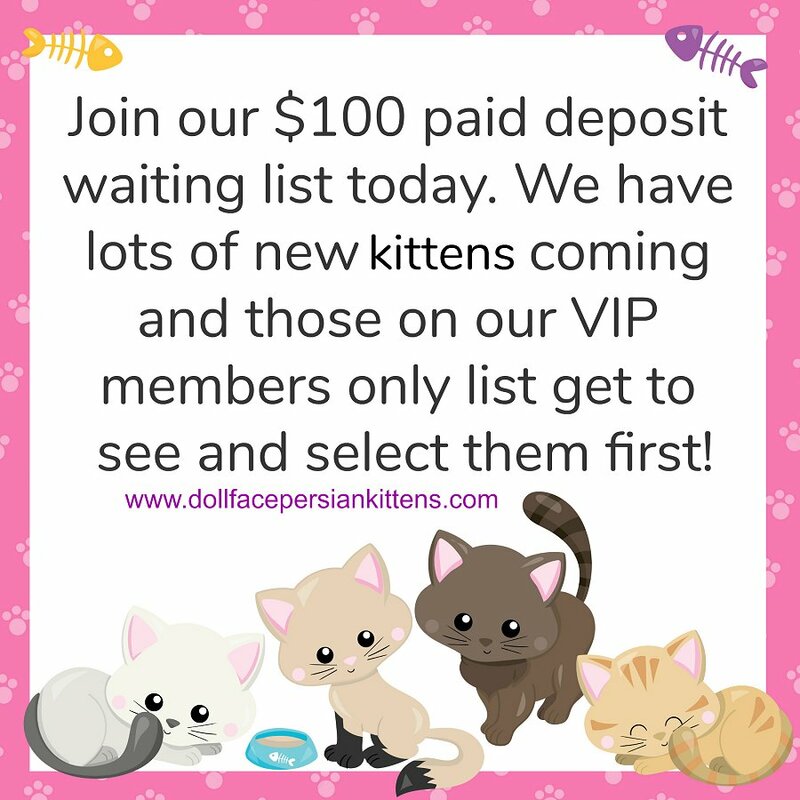 If you would like a special sneak peek and the first chance to purchase one our beautiful Persian kittens please join our VIP & paid deposit waiting list. Most of our kittens are purchased by our VIP customers before they make their debut here on our primary website. At 6-8 weeks of age, kittens will be assessed and we will decide which ones (if any) that we will keep back as future breeders. At this point, prices will be placed on these kittens and they will appear here for everyone to view and purchase. Kittens will be offered to those on our paid deposit waiting list first. Again, if you would like to join those previewing our new kitten please join our waiting list HERE. We specialize in not only in the rarest coat colors in the world, but also the angelic Toy & Teacup sized kittens and the highly sought after Exotic Shorthair Persians, Persian Folds & Rug Hugger Persians; deemed the world’s smallest cats via the Guinness Book of World Records! 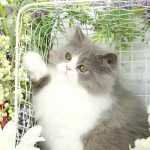 Our hybrid Rughugger Kittens and Persian Fold Kittens are often known as “Luxury Hybrids” because of their designer appearance which has been handcrafted into some of the most highly sought after cats requested on our website. These posh designer hybrids have been diligently downsized over the years and feature a wide variety of colors. The darling Rug Hugger Persian cat has rightfully earned its iconic title “The Eternal Kitten” since its legs never grow over 3″ tall, whereas the precious Persian-Fold has been deemed “The Comedian Cat” due to its floppy eared and hoot owl-eyed appearance. If you are ready to add one of our sweeties to your home, please fill out our Online Kitten Application form to apply for a kitten. If you have any questions for us, we will be happy to speak with you – just give us a call at (660) 292-2222. Persian Kittens at their finest! Clearly, Doll Face kittens are healthier and better looking (we think!) version of the Persian, Himalayan, and Exotic Shorthair cat breeds. Rather than having the extreme “pushed in” facial structure that selective breeding among fanciers has created, Doll Face kittens have a much more normal appearing face – the natural and traditional facial structure for these gorgeous felines. 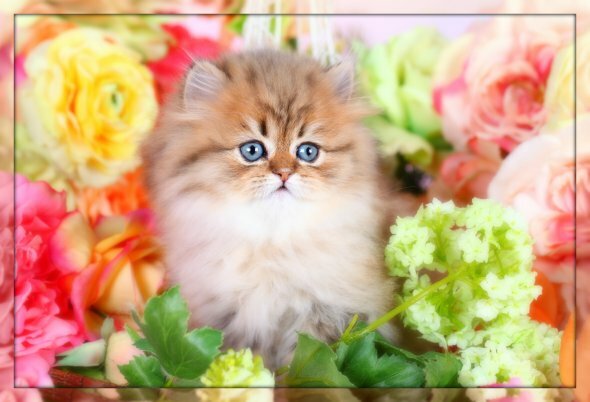 There are many benefits to the doll-face type of Persian, Himalayan, and Exotic Shorthair cat. They are MUCH healthier! Peke-faced cats can suffer from such ailments as tear duct problems which cause constant eye discharge and is associated with coat discoloration. Second, they can experience breathing difficulties such as shortness of breath, brought on by the brachycephalic (pushed in) facial structure. Extreme faced cats can also suffer from serious malformations of the eyelids, causing damage to the eyes and great discomfort and distress to the kitty. Finally, Peke-faced cats can be prone to birthing problems, with a higher incidence of difficult labor and stillbirths. So, if the sheer beauty and cuteness factor isn’t enough reason to choose a doll-face kitten, surely the health and well-being of your kitten should seal the deal! See many “behind the scene” video clips and pictures by following us on Instagram!! Here is a sample below! !